Don't look back, keep heading straight to dr. He is waiting for us with a fresh squeezed bottle of patron xo cafe black tequila. Wear em to a wedding or to the bar, we won't judge. Excellent vintage condition with decades of authentic wear and 100's of thousands of miles of globe trotting. 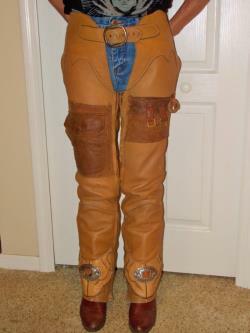 These are upcycled vintage thurlow leather world deerskin chaps. Antique and vintage leather pockets and hardware added for your items. Right leg has a flap pocket with snap closure and open side entry pocket made from a wwii bomber flight jacket and the left leg has reinforced leather protector with attachments from the same jacket. 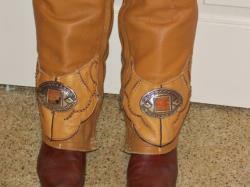 Both leg's have vintage silver concho's and boot cuffs. Comfort with protection and warmth. 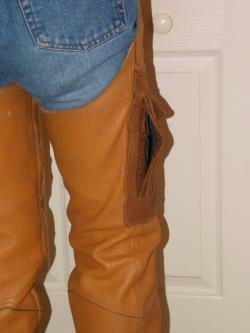 Legs are completely sheathed in deerskin when full-length zippers are closed. 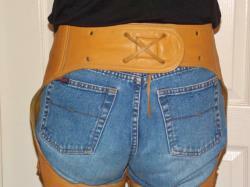 Wide belt in back for extra support has 3-inch adjustment. Zippers are on inside of legs. 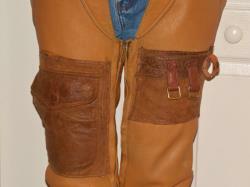 Very rare and hard to find vintage thulow chaps are the base for these reworked chaps. Everyone should have what they desire and deserve. Please check the measurements below to insure the very best fit for you. Chaps measurements taken flat: total length 41" inside length 31" waist flat measurement 15" - 20"leg opening 11.25.